Change happens most powerfully person to person – loved one to loved one. Many American Christians need help in order to stand with LGBT friends and families without leaving their faith behind. The Friends & Family Plan gives LGBT people and allies the support and expert data we need to help our conflicted Christian loved ones – as Christians – support LGBT equality. The Friends & Family Plan will help you to discuss issues of love, sexuality, and gender in Christian terms with your conflicted loved one. The Plan draws on Bible passages, insights to sway skeptical literalists, and gentle conversation strategies to ease the tension that may build during conversation. We work with a network of respected national partner organizations that you can learn more about through our Resources page. The inspiration for The Friends & Family Plan is the 2012 Sundance Award-winning documentary LOVE FREE OR DIE, which looks at church and state, love and marriage, faith and identity — and one man’s struggle to dispel the notion that God’s love has limits. 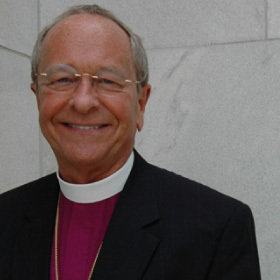 Directed by Macky Alston and produced by Sandra Itkoff, LOVE FREE OR DIE follows Gene Robinson, the first openly gay person to be elected bishop in the high church traditions of Christianity. 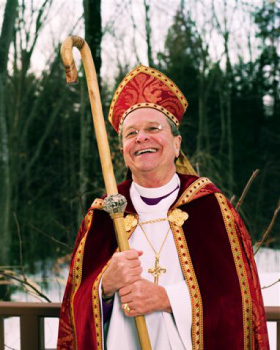 His 2003 elevation in the Episcopal diocese of New Hampshire, ignited a worldwide firestorm in the Anglican Communion that has threatened schism. 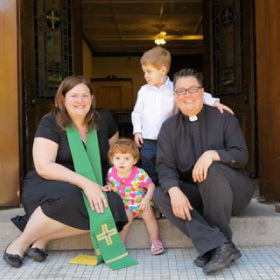 Even as he has pushed for greater inclusion within his own church, Bishop Robinson has become a standard bearer in the fight over the rights of LGBT people to receive full acceptance in church and state. The film will have its national television premiere on PBS’ Independent Lens on Monday, October 29, 2012 at 10 PM on PBS (check local listings). Alston’s camera follows Bishop Robinson as he steps onto the world stage, traveling from small-town churches to the Lincoln Memorial, where he delivers the invocation at Barack Obama’s inauguration; from London, where he is scorned and relegated to the fringes of a once-in-a-decade convocation of bishops to which he is deliberately not invited, to a decisive meeting in California of the Episcopal Church where Robinson plays an instrumental role in establishing the full inclusion of LGBT people. Through it all, Robinson steadfastly calls for everyone to stand for equality – inspiring bishops, priests and ordinary folk to come out from the shadows and change history. To learn more about the film, visit the LOVE FREE OR DIE official Web site or PBS’ interactive companion Web site which features detailed information on the film, including an interview with the filmmaker and links and resources pertaining to the film’s subject matter. The site also features a Talkback section for viewers to share their ideas and opinions, preview clips of the film, and more. 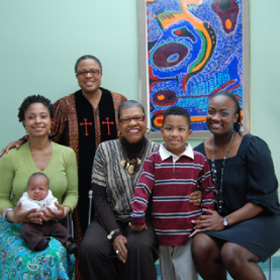 The vast majority of the images on this site are selections from We Have Faith: Lesbian, Gay, Bisexual, and Transgender Clergy and People of Faith Speak Out, the latest touring photo-text exhibit created by Family Diversity Projects. This exhibit includes interviews by Peggy Gillespie of leading LGBT clergy, allied clergy, and people of faith, and photos by Gigi Kaeser – the same team that created the award-winning travelling exhibit Love Makes A Family: Portraits of LGBT People and their Families. We Have Faith is an exceptional and inspiring resource that can help open minds and hearts. We Have Faith features renowned clergy and people of many faiths and denominations including United Church of Christ, Lutheran, Methodist, Presbyterian, Episcopalian, Catholic, Jewish, Congregational, Pentecostal, Muslim, Mormon, Unitarian Universalist, Reformed Church of America, MCC, Baptist, and Buddhist. You can bring We Have Faith to your community. Contact us to learn how.